I come back from Italy where I bought a cooking book called “Ricette della Nonna“. The recipes are traditional ones as per the title of the book which means grandmother’s recipes. 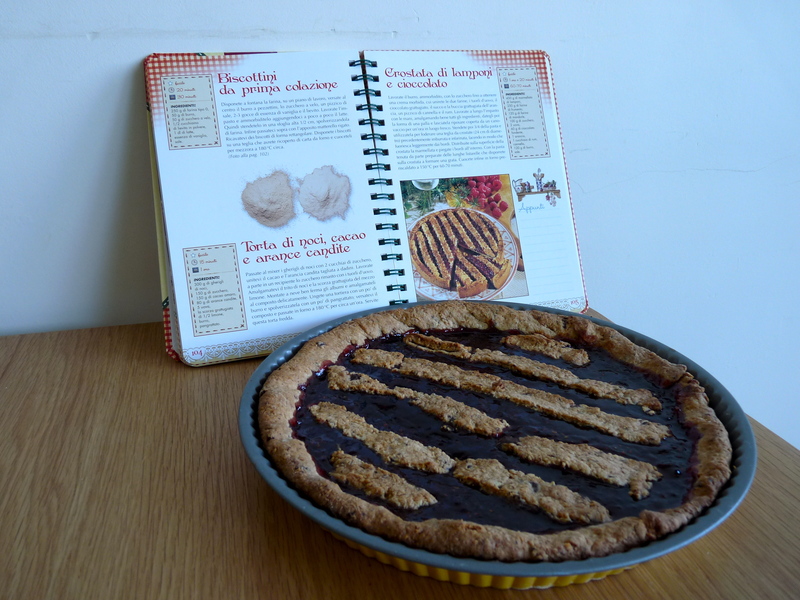 My first try is the crostata di lamponi e cioccolato. It is a pie with a chocolate pastry and raspberry jam. In a bowl, work with the hands the butter which needs to be soft and the sugar. Once this mixture is smooth, add the flour, egg yolks, and the grated chocolate. Keep working with hands andthen add the orange zeste and the juice, cinnamon and rum. Work until you get a nice pastry that you will roll in cellophane to keep it in the fridge one hour. Line 3/4 of the pastry in a tin. Spread the raspberry jam over. Spread the remaining 1/4 of pastry with the rolling pin and cut some stips to line them up over the jam. Bake the pie for one hour at 150°C.